The thing about circular ruffles is that the ruffliness is determined by the ratio of the inner circle to the outer circle– in other words, if you cut your “donut” shape with a tiny hole in the middle you’ll get really, really dense ruffles, whereas if you cut your donut shape with a big hole in the middle your ruffles will be looser. 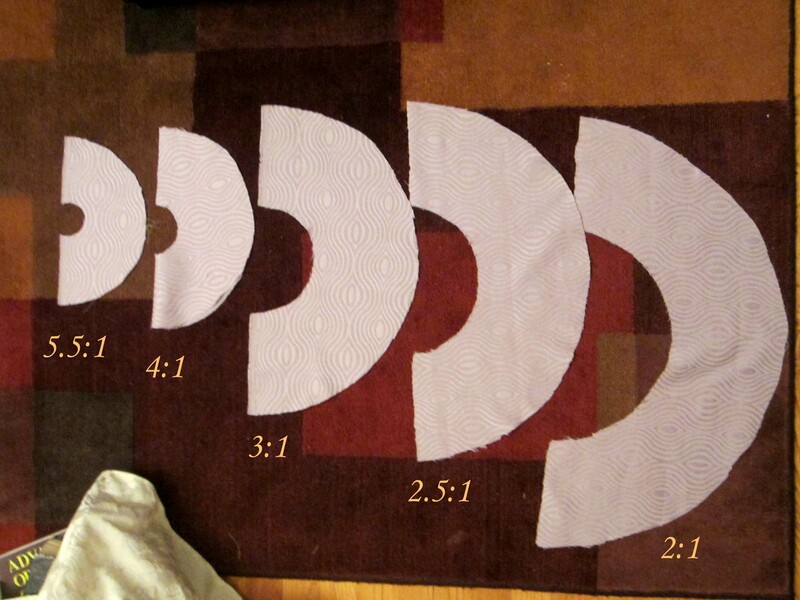 Of course, it’s tough to tell how any given fabric will drape, so I cut out several versions in half-circles before deciding on which ratios to use. For the large ruffles on the skirt, I went with a 3:1 ratio (assuming that I’d need the ruffle to be 6″ wide before hemming and finishing). I thought I’d need something more dense for the smaller ruffles on the neckline and sleeves, so I did a 4:1 ratio for those. After I cut everything out I started to join the cut ends of the circles to make longer ruffle pieces, and figured that I’d have to do something to treat the cut edges to prevent fraying. 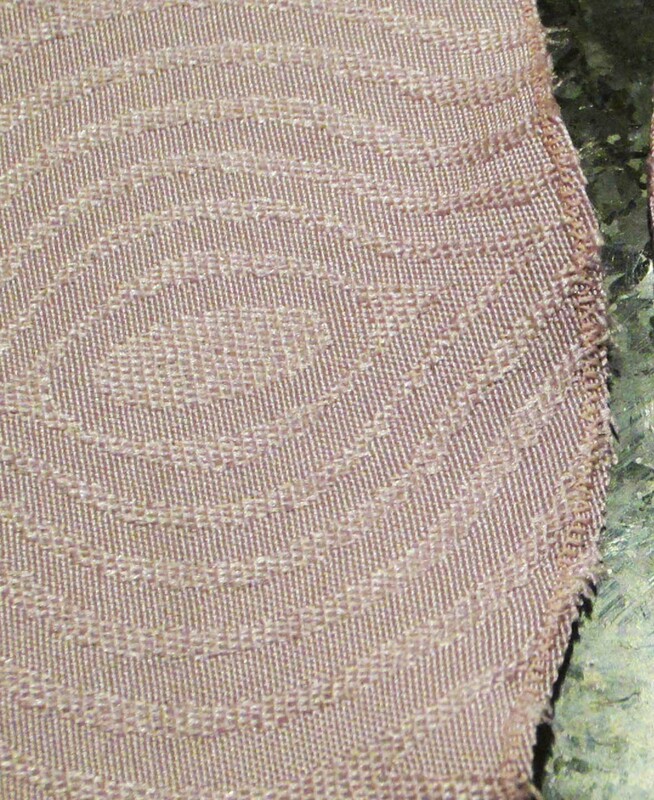 Not having a serger and reluctant to use french seams due to the added bulk, I tried running a very dense, very narrow zig-zag along the edge– almost like a satin stitch. It actually worked really well. So well, in fact, that I thought it might actually work to finish the curved edges as well instead of hemming, which I wasn’t looking forward to anyway. Experiments showed that it worked perfectly, and the tiny thread ends that did show on the edges were barely noticeable. Hooray, no hemming! Of course, then the problem was that I’d planned on needing a hem allowance for my ruffle width, cutting the ruffles accordingly– if I left them as-is they’d be too wide, and if I cut them narrower my ruffle ratios would be off. I ended up cutting them, which worked out all right anyway… so much for my careful experimenting with ratios. 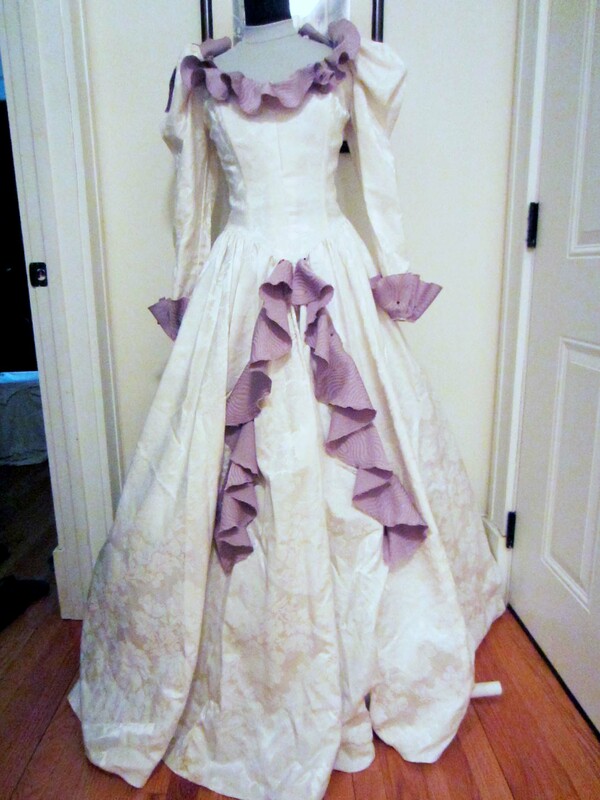 Here are the ruffles, pinned to the dress. They’re definitely fuller than the ruffles in the movie, but I like the effect. Besides, I tried using a looser ruffle for the skirt, and all it did was make the ruffle fall into fewer, larger folds, rather than more, shallower folds. 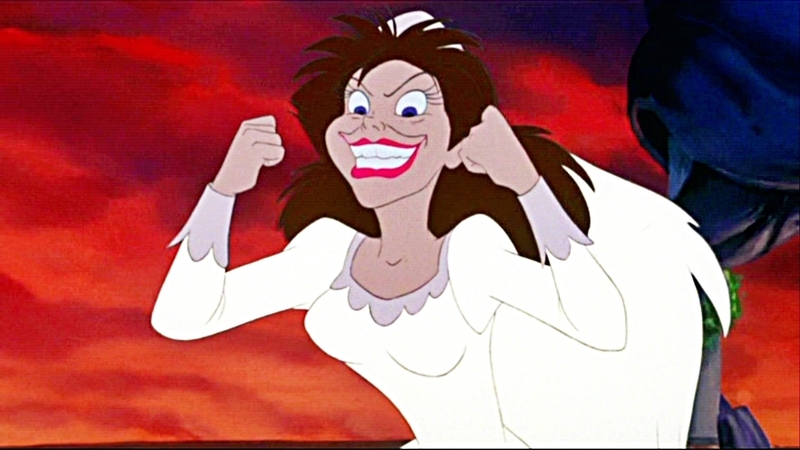 Besides, animators aren’t constrained by things like physics, so I’m not going to worry about it. I’m going to hold off on stitching them down (which I’ll do by hand, at least for the skirt parts) until I get the tentacle shapes finalized, just so I know how things will hang on the final costume. Just curious, how did you get the wrist ruffles to stay “up” like that? I can only imagine by tacking them in a few key places, maybe? 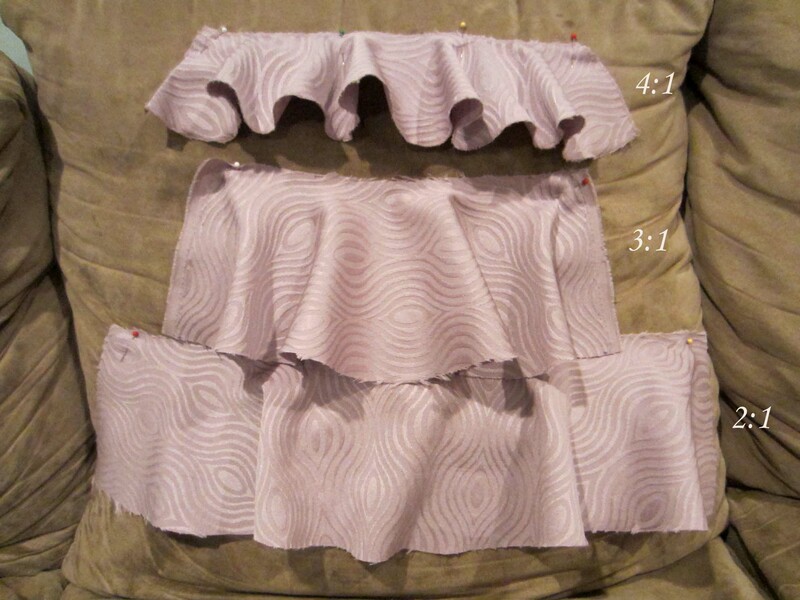 Yes, I hand-tacked the ruffles down in maybe one or two places– it didn’t take many, since the fabric was relatively stiff and the direction of the stitching at the cuff kept it pointing in the correct direction. Great, thanks! 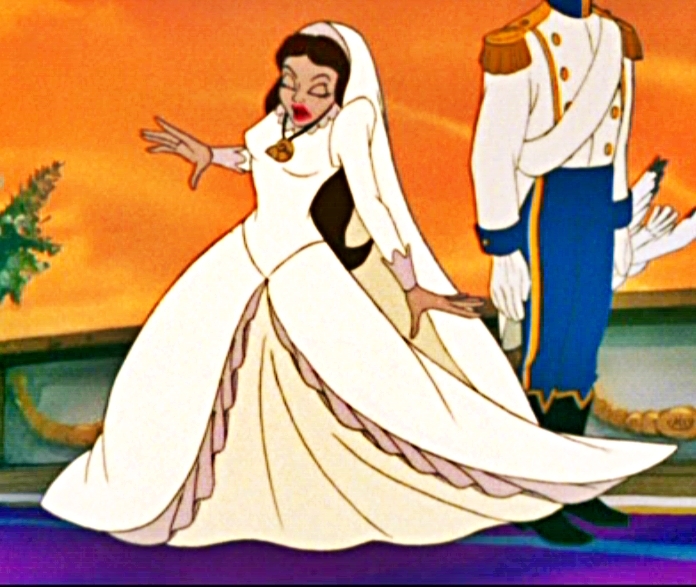 I’m using a poly satin that is pretty drapey, so I may experiment with interfacing or a horsehair braid. But at least now I have a jumping off point!